Obviously designed with the high-end gamer and high-performance systems in mind, the Thermaltake Toughpower 1500W can clearly deliver power to a wide range of components, including high-end PCI Express graphics cards. Importantly, throughout the testing the Thermaltake Toughpower 1500W managed to perform to 100 per cent of all the manufacturer's performance claims. In terms of total efficiency it put in a good performance for a high-end unit, coming in ahead of the SilverStone Strider Plus SST-ST1000-P and the Nexus RX-1.1K Gold. It then promptly fell down in terms of standby efficiency being one of the worst performers in its power range. Good heat management and a large 140mm fan helped the PSU produce a lot less decibel noise compared to other similar supplies, such as the Antec TruePower Quattro 1200, with it being the quietest in its class. That large fan also performed well venting heat, with the PC remaining cooler on the inside than the exhaust port and the cables did not significantly heat up during high loads. We can happily report that the tested rails were all within the ATX-specified tolerances and the Toughpower 1500W produced an almost jitter free voltage reading at 75 per cent load, making a near flat line for less electrical interference. The Toughpower 1500W is a pleasingly rugged unit, feeling solid and very welt built. Thermaltake has also taken care with the design, with an olive green casing that integrates with the fan grate to form one solid unit and beside the honeycomb vent is a transparent red rocket switch giving the unit a nice retro feel. 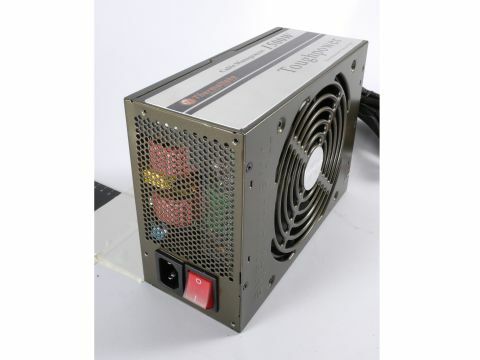 Physically, it's bigger than a standard-sized PSU with dimensions of 200 x 85 x 150mm, and the Thermaltake Toughpower 1500W is quite a lump, weighing in at 2.940kg. The manufacturer's stated AC power input is 230V 10A 47-63Hz. The Toughpower comes with a total of 29 output connectors; 1x ATX 20/24-pin connector, 1x 8-pin connector, 1x 4+4-pin connector, 4x PCI Express 8-pin connectors, 4x PCI Express 6-pin connectors, 8x SATA connectors, 8x 4-pin peripheral (MOLEX) connectors and 2x floppy connectors. This is a good, solid high-end PSU that would happily power any high-end gaming rigs, but at this price its poor standby performance lets the unit down.